Preparing your child for their academic future from day one. Helping children grow and learn since 2002. 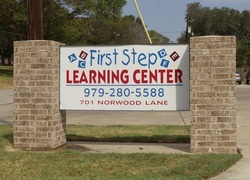 First Step Learning Center is much more than just a daycare, we are a structured learning environment for your child. Locally owned and operated, we have been in business since 2002. Our facility is state licensed and we have been a recognized Texas Rising Star Facility since 2010 for going above and beyond all state requirements. At First Step Learning Center, we develop programs to fit the needs of your children so that they may reach their full potential. We work to build a foundation for your child to do well in school through exploring, experiences and challenges. Children learn problem solving, develop language skills, social skills, and develop emotionally and cognitively through play and daily activities. These activities help to introduce and teach concepts needed to build this foundation. Our loving and caring staff understand the difficulties, commitments and responsibilities that parents are faced with, and offer you peace of mind where your child is concerned. At First Step Learning Center, your child will receive quality care in a loving, accepting, nurturing and encouraging environment. We believe that children learn best in a creative and natural learning environment. Here at First Step Learning Center, we strive for the daycare experience to be a positive experience for children, parents and staff. We rely on open and honest communication between our staff and parents, and work side by side with parents to promote cleanliness, potty training, good manners, etc. Our doors are always open for parents to stop by and take a look around, check in with staff and visit with the director.